Awaken your heart with Pema Chödrön—a six-session online training course. Do you want to love and connect with others more deeply, but need a little help? 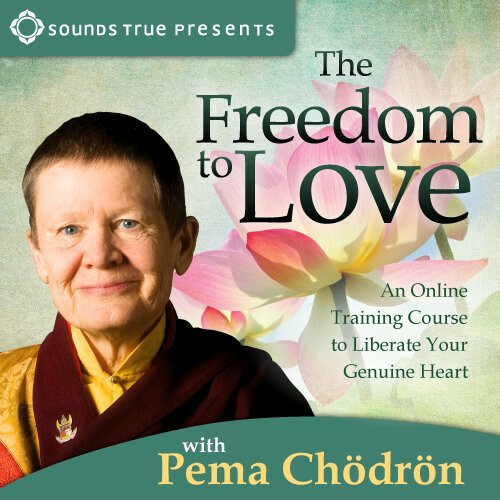 With The Freedom to Love, Pema Chödrön invites you to start wherever you are—with any challenges, frustrations, or fears you may be facing—and use them as the launching pad to awaken the natural and boundless capacity of your heart. Through six sessions of intensive learning and practice, this beloved and gifted teacher will guide you through traditional Buddhism’s traditional awakened heart training . . . with a difference. Pema might have named this course “Working with the Hard Stuff”—because here she’ll be showing us how to use the principles of The Four Immeasurables in our most challenging situations, relationships, and emotional states. The Freedom to Love will engage you with written teachings, video and audio sessions, weekly self-reflection practices, deep meditation, plus two revealing sessions recorded with Pema Chödrön answering questions from a live audience. If you’ve ever had the opportunity of attending a dharma talk with her, then you know that Pema’s Q&A discussions often reveal her most unexpected, entertaining, and memorable insights. Here you are invited to come as you are—calm, confused, or just in need of a heartfulness tune-up—to begin unfolding your natural and joyful qualities of compassion, self-acceptance, connection, and unconditional love. This is a great course for handling habitual responses. The message is clear, simple & damn practical! I have been involved in many mindfulness classes, they all oriented me toward focusing on visceral sensations to manage emotions & develop resilience. They were all beneficial but never completely fulfilling as this course is. The simple act of labeling visceral sensations as 'Shenpa' while pointing to the 'hooking' quality of them was a game changer. The familiarization of Shenpa as a concept made me able to accept them with complete clarity & wisdom. The content was excellent and of course Pema Chodron is always incredibly comforting and supportive. I have had much difficulty downloading the videos in particular. It would seem they have downloaded but when I try to play them, the video and audio stops even though the timer keeps running. Mind you I seem to have been able to download the live session today and am monitoring it to see if it plays through. I have greatly enjoyed this course. It may have been worthwhile to have one session at the end of each week that allowed us to see a composite set of a few questions from those in attendance, so that we could hear Pema's responses. I know it would have to be brief, but even 20 minutes or so of this kind of segment would be insightful.